I actually mentioned this product in my 5 Great Affordable W7 Products You Should Try post. Anyway W7 Flirty Eyes is a mascara that reminds me of the slightly pricier Maybelline Falsies Volume Mascara. The W7 offering features a large wand that is made up of plastic spikes rather than the typical brush-type bristles that you often see. What I like about this product is the fact that you can really work it into your lashes to get a good even covering thanks to the flexible brush head. The formula is slightly dry so you do have to work fast with it to ensure that you apply quickly or you’ll experience a little clumping but as long as you apply nice even layers, you can still build it up. If you’re after good volume with the addiction of a little length, I definitely recommend checking this out. This product currently retails at just £2.24 and is available to purchase on the Amazon website. 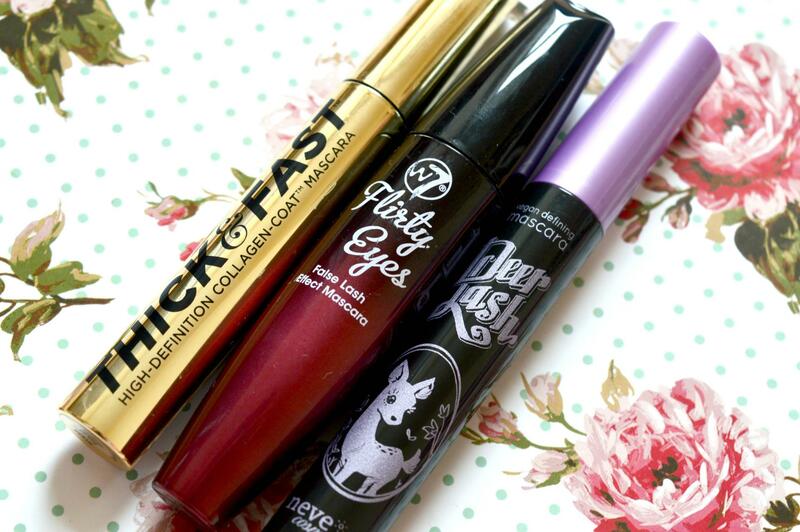 The second mascara to make it into my post is the Soap and Glory Thick and Fast HD version. This product comes in a beautiful gold tube. The product features a 7 sided fan flare 180 brush with a v-groove that is said to add volume and drama. The formula is also said to feature collagen which is meant to be strength building. Personally I feel like this is an all round great lash product. For me you can add some really great volume to the lashes without giving them a clumpy appearance. I also find that I can add a nice bit of length to my lashes too without them looking too dramatic. This mascara currently retails at £10.50 and is available to purchase from Boots both online and in store. And the final product that I’d like to mention is the Neve Cosmetics Deer Lash Mascara. If you’ve not head of Neve Cosmetics, they are an Italian makeup brand that offer some really reasonably priced cosmetics that perform pretty darn well. This lash product is one of the more recent products I’ve tried from the brand. As you can see from the image above the packaging of this product is utterly adorable. This product features a natural ingredient formula. The formula that is made up of sunflower seed wax as well as pigment extracts from ubame oak charcoal. The brush applicator is a thin plastic offering which works wonders at separating lashes for a flawless clump free finish. For me this product adds wonderful length to my lashes giving me a doll-like look. In terms of volume, I can’t say it adds much for me. However, you can always use another mascara in addition to achieve more volume. It is also worth noting that the formula is free of parabens, petroleum, silicones, acrylates and animal derivatives making it a vegan friendly product. The product is available to purchase from the Neve Cosmetics website for €12.50 which is around the £10 mark. This product was sent to me for consideration. All views, thoughts and opinions are 100% my own and aren't influenced by any brand, company or individual.